Why do captive dolphins and whales need sunscreen? Dolphins and orcas in the wild spend most of their time below the surface of the water. But in captivity, they can often be found floating motionlessly at the surface of their shallow pools. As a result, captive dolphins and orcas are at risk of sunburn (sunburn is not only painful, but can lead to a dangerous infection). On July 14, the U.S. Department of Agriculture conducted a routine inspection at Theater of the Sea, a marine park in Islamorada (Florida Keys). The USDA inspector found that the saltwater pools at the park have “minimal or no shade” for its dolphins. 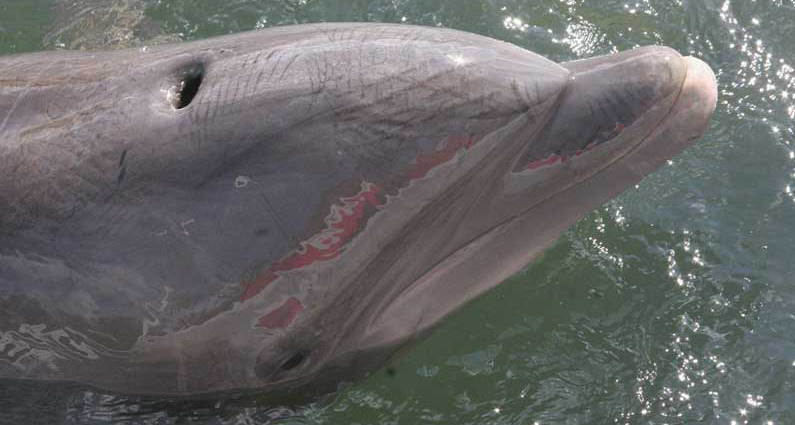 The USDA inspector noted that one dolphin, Stormy*, had sunscreen (zinc oxide) on his head to prevent sunburn. “In order for ‘Stormy’ to get away from the sun,” the inspector wrote, “he must seek shade by the small mangroves shallows and remain virtually motionless.” Theater of the Sea received a citation for failure to provide appropriate shelter/shade for its dolphins and sea lions. *Stormy was captured from the Gulf of Mexico in 1986. In the early to mid 1900s, the American alligator was decimated by hunters looking to make money (by selling the alligator’s skin). Alligator numbers recovered after the species received federal protection in 1967, and hunting began again in Florida in 1988. Today, the alligator is the only animal in Florida that hunters kill in expectation of a financial reward. The skin and flesh of dead alligator’s is often sold following the hunt. The 11-week hunt, which begins on August 15, is barbaric. Alligators are snagged with barbed hooks, pierced with arrows, stabbed with harpoons, and shot with a firearm called a “bangstick.” Only then is the animal pulled into a boat where he or she is finally killed by a knife or screwdriver that severs the spinal cord and is inserted into the brain cavity.